Cityworks is a modular barrier system that is easy and quick to erect and take down, comprising base modules that are completely interchangeable. Light, manageable and robust Cityworks is the ideal solution to delimit and fence temporary work areas, both inside and outside (even if only for a very short time) or for controlling crowds during public manifestations. Thanks to the simplicity of erection Cityworks can be used internally to partition work and production areas and to delimit reserved access areas within buildings. In fact, it is possible to assemble Cityworks to form crossroads of two, three or four paths. 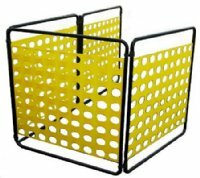 Packed in cartons containing one unit, Cityworks is easily erected in any form that the user desires thanks to the patented HDPE net and frame structure. Cityworks 100 is supplied ready to make up in a cardboard carton, while Cityworks 300 and Cityworks 400 are supplied, in cartons already made up.